WHAT'S INCLUDED IN THE COSMIC KIDS TEACHER TRAINING COURSE? What do I get when I sign up to the program? the 'how-to' of kids yoga: how you perform a story incorporating yoga postures so the kids follow you - so they get the benefits of the yoga. Video Feedback from me - to graduate with full Cosmic Kids certification, I ask students to send in a video of them teaching a class. I watch all of these and offer detailed personal feedback via video. Your feedback (and certification if you meet the required standards) will be sent to you within 28 days of your submitting the final assessment video. 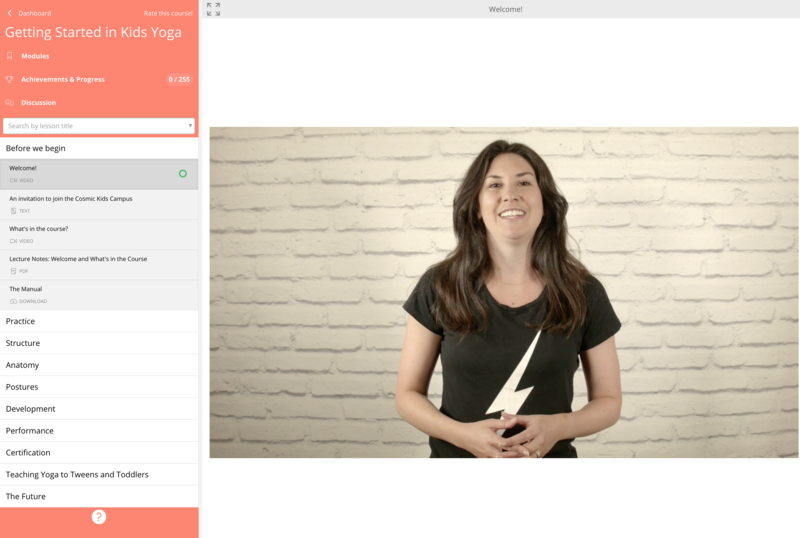 Sections on how to teach kids yoga to Tweens and Toddlers - plus classplan walk throughs. Information on what you need to teach kids yoga professionally. This is what it looks like - it's an online course, with some practice and activity required for full certification.